Chaithra maasam has a lot of significance in Hindu philosophy and is the first month in the hindu calender. Chaita literally means temple or Sign (memorial). According to the Hindu philosophy, Lord Brahma created this universe on Ugadi day. Sriram Navmi and Hanuman Jayanti are also celebrated during this month. Purnimant calenders are fallowed in Rajasthan, Uttar Pradesh, Madhya Pradesh, Punjab, Himachal Pradesh and Bihar. Here chaitra Masam starts on 24th March 2016 and ends on 23rd April 2016. Amavasyant calenders are fallowed in Andhra Pradesh, Goa, Maharashtra, Gujarat, Karnataka and Tamil Nadu and here chaitra masam starts on 8th April 2016 and ends on 7th May 2016. Chaitram is also a sacred month to start Vedic learning. That’s why it is one of the most auspicious and sacred months for performing Upanayana. 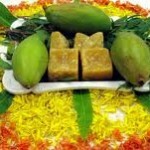 This month falls during the Vasanth ritu (Spring) and also known as Madhu Masam.